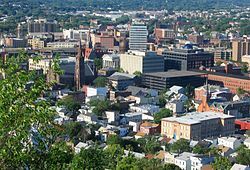 ^ Gnis|885343|City of Paterson, Geographic Names Information System, accessed May 26, 2007. ^ a b 2011 Apportionment Redistricting: Municipalities sorted alphabetically, New Jersey Department of State, p. 8. Accessed September 4, 2011. ^ "The Story of New Jersey's Civil Boundaries: 1606-1968", John P. Snyder, Bureau of Geology and Topography; Trenton, New Jersey; 1969. p. 210. ^ “New Jersey Resident Population by Municipality: 1930 - 1990”. 2007年3月3日閲覧。 . ^ Campbell Gibson (1998年6月). “Population of the 100 Largest Cities and Other Urban Places in The United States: 1790 to 1990”. 国勢調査. 2007年3月6日閲覧。 . ^ Paterson City Council, accessed September 5, 2006. ^ League of Women Voters: 2006 New Jersey Citizen's Guide to Government, p. 62, accessed August 30, 2006. ^ Bruce Arians, Pittsburgh Steelers. Accessed November 25, 2007. ^ Rubin "Hurricane" Carter Biography (1937-), accessed November 28, 2006. ^ "≪I Sopranos? No agli stereotipi ma non facciamone un dramma≫ - Federico Castelluccio, il Furio Giunta della celebre serie tv, a Toronto per incontrare gli zii" Archived 2007年11月3日, at the Wayback Machine., Corriere Canadese, May 11, 2005. ^ Biography for Lou Costello, accessed November 28, 2006. ^ "Trading on a great education wp's richard reiss has a conversation with E*TRADE ceo christos cotsakos" Archived 2007年3月11日, at the Wayback Machine., WP: The Magazine of William Paterson University"], Fall/Winter 1999. Accessed December 6, 2007. "Born and raised in Paterson, New Jersey, Cotsakos was a 1965 graduate of Eastside High School. He will tell you -- 'barely.'" ^ Paterson Is Making Move to Honor Doby, The New York Times, June 27, 1997. ^ James, George. "IN PERSON; Slugging It Out All These Years", The New York Times, June 9, 2002. Accessed November 4, 2007. "Lou Duva grew up the second youngest of seven children in a working-class family in Paterson." ^ Cahillane, Kevin. "WORTH NOTING; White Sox Fans? Say It Ain't So", The New York Times, September 25, 2005. Accessed December 9, 2007. "Mr. Einhorn -- who was born and raised in Paterson and lives in Alpine -- is the flamboyant yin to the steely yang of the principal owner, Jerry Reinsdorf." ^ Hampton, Wilborn. "Allen Ginsberg, Master Poet Of Beat Generation, Dies at 70", The New York Times, April 6, 1997. Accessed December 4, 2007. "Allen Ginsberg was born on June 3, 1926, in Newark and grew up in Paterson, N.J., the second son of Louis Ginsberg, a schoolteacher and sometime poet, and the former Naomi Levy, a Russian emigree and fervent Marxist." ^ Blumenthal, Ralph. "Philharmonic Gets Diary Of a Savvy Music Man", The New York Times, July 29, 2002. Accessed November 15, 2007. "Hill played violin with the orchestra until he was over 70, then fell into poverty and depression. In 1875, living in Paterson, N.J., he wrote a farewell note to his second wife: Why should or how can a man exist and be powerless to earn means for his family?" ^ Thomas McEwan, Jr., Biographical Directory of the United States Congress. Accessed August 11, 2007. ^ via Associated Press. "Dave Prater, 50, Dies; Soul Singer of the 60's", The New York Times, April 13, 1988. Accessed November 4, 2007. "Dave Prater Sr., of the soul-singing duo Sam and Dave, was killed Saturday when the car he was driving went off Interstate 75 near Sycamore, Ga., and hit a tree. He was 50 years old.... Mr. Prater had lived in Paterson since 1974 and his body will be returned to New Jersey for burial next week, his widow, Rosemary, said Monday." ^ Amos Henry Radcliffe biography, United States Congress. Accessed July 23, 2007. ^ Marcel Shipp player profile, National Football League Players Association. Accessed July 24, 2007. "Hometown: Paterson, N.J... Played one year of prep football at Milford (Conn.) Academy and was all-New Jersey choice as a senior at Passaic County Technical High School"
^ Floyd Vivino profile from Sirius Satellite Radio, accessed December 20, 2006. ^ Yannis, Alex. "HOCKEY;The Devils, And Fans, Ignite First Match", The New York Times, October 8, 1995. Accessed November 25, 2007. "Moments after the banner was raised, Patrick Warburton, the actor who portrayed a fanatic Devils' fan in a segment of the "Seinfeld" television show, was called upon to drop the puck. With his face painted in Devils red and black, the native of nearby Paterson dropped the puck, then stripped the Brodeur jersey he was wearing to display the letter D on his chest."